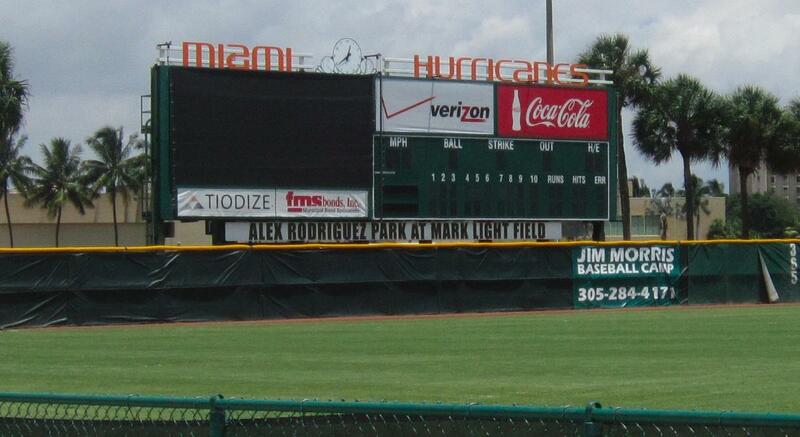 A baseball stadium at the University of Miami was renamed in honor of Yankees player Alex Rodriguez after he donated $3.9 million to renovate the stadium in 2003. Although Rodriguez never attended the University of Miami, he has a very visible connection to it. While in high school, Rodriguez verbally committed to play for UM, according to Jockbio.com, though he took an offer from the Seattle Mariners instead. In 2003, Rodriguez pledged $3.9 million to renovate UM’s baseball stadium, according to ESPN. The stadium was renamed in his honor and he was made an honorary alumnus of the school. UM has declined to comment on whether the stadium will continue to bear Rodriguez’s name. It would not be the first time the university removed a disgraced name from one of its campus locations. Former UM football booster Nevin Shapiro had his name on a student-athlete lounge after making a financial donation, but after investors in Shapiro’s $900 million Ponzi scheme filed a lawsuit against his company in 2009, UM removed Shapiro’s name from the lounge and returned the money. In cases like these where a donor’s name has been disgraced, their reputation and the purpose behind the gift have to be reevaluated, said Rae Goldsmith, vice president of the Council for Advancement and Support of Education. “The Enron chair of business ethics is going to send a different kind of message than the Enron chair of the arts,” Goldsmith explained. She said a school’s decision would also be influenced by factors such as whether the pledge had been fulfilled, which UM has declined to state. Alex Rodriguez’s name is also on the building that houses the Boys and Girls Club of Miami-Dade’s charter school at the Alex Rodriguez Educational Center. Rodriguez funded the Education Center named for him with a $1 million donation in 2009, according to the statement. He has also funded the renovation of baseball fields at several of the clubs’ locations and underwritten the costs of the club’s baseball leagues for over a decade.